Top, Rachel Sherwin and Kailey Fiewig working on their entries. Left, Sam Lisk and his mousetrap vehicle. FLINT TWP. 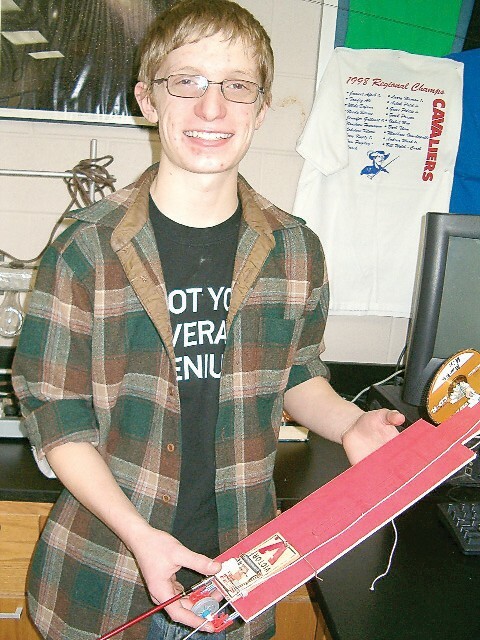 — Carman-Ainsworth senior Sam Lisk has spent countless lunch hours perfecting a Rube Goldberg device he hopes will earn him a medal Saturday at the regional Science Olympiad competition at Mott Community College. A Rube Goldberg device conducts a complicated chain reaction to complete a simple task. In Lisk’s case, the final step will launch a balloon imprinted with his team’s name. Lisk with his teammates Jacob Linder and Jon Robinson, both juniors, will enter a category called Mission Impossible. Their device is a wacky assembly of items including K’NEX building parts, empty plastic bottles, Hot Wheels track, batteries and balloons that perform operations such as weight dropping, pins pulling out, a mousetrap snapping and vinegar mixing with water to create a chemical reaction. Judges award points for creativity and the number of energy transfers in the device such as converting kinetic energy, mechanical energy and electrical energy, said Avideh Lotfi, CAHS chemistry teacher who is a coach for the Olympiad students along with Tom Pugsley, physics teacher and Krystal Roos, biology teacher. Lotfi is especially impressed with Lisk’s dedication to his project, including spending all of his lunch hours working on it. Lisk has shown motivation and energy far above what he usually displays in his regular classwork, Lotfi said. Lisk said this was his chance to indulge a longtime interest in building a Rube Goldberg device. “I love engineering. It’s my passion,’’ said Lisk who already is taking classes at Kettering University where he plans to major in mechanical engineering and minor in bioengineering. He had help from his teammates building the Rube Goldberg device but the concept and design were all his baby. “We were given a list of things we could do,’‘ Lisk said. “ I used all the tasks that earn the most points.’’ That’s why expectations are high for him to win a medal if the device works properly on Saturday. Lisk also is working on a entry for the Mousetrap Vehicle category. Thirty students — two teams of 15 – are preparing Olympiad entries, Lotfi said. They will compete against about 20 other schools in categories such as Wind Power, Tower building, Optics, Protein Modeling, Sumo Bots, Technical Problem-solving, Remote Sensing, Forensics, Ecology and more. Kailey Fiewig and Rachel Sherwin, both juniors, are working on an entry for the Sound of Music category which requires building musical instruments from scratch then playing a tune on them. They are required to make one percussion and one wind instrument, Sherwin said. Their instruments are made of PVC pipe and resemble a xylophone and a trombone. They will use flip flops as mallets to play the percussion instrument. Anthony Johnson, junior, is entering the Towers event. His balsa wood creation will be judged by the weight of a bucket of sand it can hold. Coach Roos said she has high hopes for some of her biology students entering the Disease Detectives category focusing on food borne illnesses and Microbe Mission which works with microscopes. An overall team finish of first or second place will earn the students a trip to the state Science Olympiad in Lansing. Lotfi said the CAHS team finished fourth overall last year but last went to a state meet about six years ago. National competitions are a whole other level. 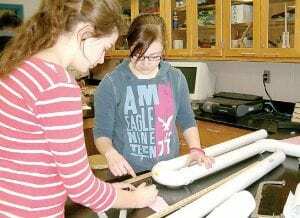 Science Olympiad began 27 years ago as a grassroots assembly of science teachers and has become the premiere science competition in the nation with a rigorous, standardsbased format providing challenges to nearly 6000 teams in 50 states.